Canadian-owned exploration company Rathlin Energy UK first conducted tests on shale rocks beneath the East Riding of Yorkshire in the UK in 2014 to help determine whether the formation is capable of being hydraulically fractured - the technical name for fracking. Rathlin is wholly owned by Calgary-based Connaught Oil & Gas, a private Canadian company. Following 'encouraging' data, the firm said it planned to carry out more tests at West Newton in 2016, and in August 2016 was granted two permits by the Environment Agency for the new oil and gas exploration West Newton B site. It was expected to begin site construction work there in early 2018 but as of November, no work had been done. In November 2018 it emerged that Rathlin UK owes nearly £34m to its 'ultimate' parent company in Canada according to its annual accounts. Its auditors, KPMG, warned that the debts “constitute a material uncertainty that may cast significant doubt on the Company’s ability to continue as a going concern”. The report noted that there was "uncertainty as to the ultimate parent’s ability to continue to finance the company’s operations” and that Rathlin was "dependent on these loans not being recalled". 1.2 Environmental permits - mission creep? Environmental permits - mission creep? In March 2014, Rathlin Energy was seeking environmental permits to carry out a series of tests on two wells at Crawberry Hill and West Newton, near Hull. The plans include so-called 'mini fall-off tests' in the Bowland shale rocks, which stretch across the north of England. Rathlin said the mini fall-off test would involve pumping up to 10,000 litres of water and potassium chloride into the shale rocks at pressure, “up to the point where the rock begins to be fractured”, to test how it permeates into the rocks. Rathlin announced in August 2015 it would abandon its exploratory well at Crawberry Hill on technical and commercial grounds. Restoration of the site was completed by April 2016. In September 2014 locals complained about noxious smells coming from Rathlin's exploratory oil and gas well at West Newton. The Environment Agency ordered the firm to rectify the situation and reportedly recorded at least 14 breaches by Rathlin. In late 2015 East Yorkshire councillors voted to extend Rathlin's permission to operate the West Newton A exploratory site for another three years but added a specific no-fracking clause. In November 2018, Rathlin applied once again to extend the West Newton A oil and gas site operation for three more years. According to Drill or Drop's coverage of the council hearing on the application, "planning officers have recommended approval of the application with a no-fracking condition. But there have been more than 100 objections, including two nearby parish councils". The three-year extension was narrowly approved by a six-five vote on 15 November. 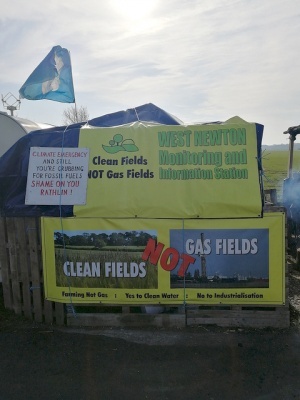 Serious concern around Rathlin's operations and over the inability of the Environment Agency to effectively monitor the site led to local residents setting up the 'West Newton Monitoring and Information Station' on the grass verge outside the well site in January 2019, the same month that Rathlin drilled the conductor pipe for a second oil and gas well at the West Newton site. David Montagu-Smith, Chairman of the Board of Directors, Rathlin Energy Limited and Rathlin Energy (UK) Ltd. Director since 21 Jan 2008. John Hodgins, CEO, Connaught Oil & Gas Ltd. Director, Rathlin Energy Limited and Rathlin Energy (UK) Ltd. Director since 21 Jan 2008. Robert Standley, Director, Rathlin Energy Limited and Rathlin Energy (UK) Ltd. Director since 21 Jan 2008. Simon Taylor, head of communications (circa 2015-17). Taylor is a director of Mercury Design and Marketing and Mercury Energy and Public Sector Services Ltd (Company Number 09623182), which cites Rathlin as among its successes. Weber Shandwick from September 2011 to 2015. ↑ John Vidal, East Yorkshire gas-drilling site making locals ‘sick from noxious smells’, The Guardian, 19 September 2014, accessed 29 September 2016. This page was last modified on 23 February 2019, at 07:11.